The Andromeda galaxy. Credit: Adam Evans. German astronomers have conducted a study of the central bulge of the Andromeda galaxy and analyzed its stellar populations. The research could improve our understanding of the bulge's structure and formation history. Results of the study are presented in a paper published July 24 on the arXiv pre-print repository. Located some 2.5 million light years away from the Earth, the barred spiral Andromeda galaxy, also known as Messier 31, or M31 for short, is the nearest major galaxy to the Milky Way. Due to its proximity, M31 is an excellent target to study the detailed evolutionary history of large spiral galaxies. Andromeda's central bulge is crucial for such studies, so recently, a team of researchers from Germany led by Roberto Philip Saglia of the Max Planck Institute for Extraterrestrial Physics in Garching, decided to analyze the stellar populations of this region in detail. For their research, the team used the 2.7 meter telescope at the McDonald Observatory in Texas to obtain spectroscopic data of M31. The observational campaign allowed the astronomers to uncover simple stellar population properties of the central region of this galaxy, including age, metallicity and alpha-elements abundance. 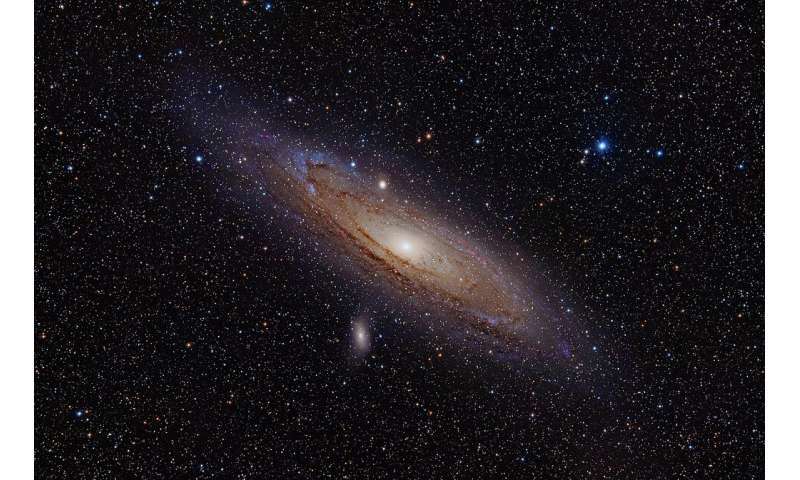 "We observed M31 for 14 nights with the integral-field spectrograph VIRUS-W attached to the 2.7m telescope at the McDonald Observatory, Texas, covering the bulge area with a filling factor of 1/3 and sampling the disk along six different directions, reaching approximately one scalelength along the major axis," the scientists wrote in the paper. According to the study, the stellar populations in the central region of M31 are fairly old—more than 10 billion years old. In comparison, the stars of the galaxy's disk are younger by 5 to 6 billion years. In particular, the researchers found that the central 100 arcsec of this galaxy is dominated by old, metal-rich stars at the center with a negative gradient outwards and enhanced in alpha elements. The study reveals that M31's bulge as well as bar have solar metallicities. The team also found that the bar and bulge have a mean age of 10 and 13 billion years respectively. The authors of the paper concluded that their result suggest a two-phase formation scenario for the inner region of M31. "A classical stellar bulge forms together with a primordial disk, from a quasi-monolithic collapse or violent instability of the turbulent inner proto-disk. On larger scales, the proto-disk develops a bar. The bar buckles and transforms the proto-disk into the boxy-peanut B/P bulge. The stars in this region are mainly old," the researchers concluded. The team plans further studies of M31 that might shed further light on the sequence of events that built the central regions of this galaxy. Moreover, they will try to calculate the rate of microlensing events expected from the self-lensing of the different populations of the central region of the Andromeda galaxy. We continue the analysis of the dataset of our spectroscopic observation campaign of M31, by deriving simple stellar population properties (age metallicity and alpha-elements overabundance) from the measurement of Lick/IDS absorption line indices. We describe their two-dimensional maps taking into account the dust distribution in M31. 80% of the values of our age measurements are larger than 10 Gyr. The central 100 arcsec of M31 are dominated by the stars of the classical bulge of M31. They are old (11-13 Gyr), metal-rich (as high as [Z/H]~0.35 dex) at the center with a negative gradient outwards and enhanced in alpha-elements ([alpha/Fe]~ 0.28+- 0.01 dex). The bar stands out in the metallicity map, where an almost solar value of [Z/H] (~0.02+-0.01 dex) with no gradient is observed along the bar position angle (55.7 deg) out to 600 arcsec from the center. In contrast, no signature of the bar is seen in the age and [alpha/Fe] maps, that are approximately axisymmetric, delivering a mean age and overabundance for the bar and the boxy-peanut bulge of 10-13 Gyr and 0.25-0.27 dex, respectively. The boxy/peanut-bulge has almost solar metallicity (-0.04+- 0.01 dex). The mass-to-light ratio of the three components is approximately constant at M/LV ~ 4.4-4.7 Msol/Lsol. The disk component at larger distances is made of a mixture of stars, as young as 3-4 Gyr, with solar metallicity and smaller M/LV (~3+-0.1 Msol/Lsol). We propose a two-phase formation scenario for the inner region of M31, where most of the stars of the classical bulge come into place together with a proto-disk, where a bar develops and quickly transforms it into a boxy-peanut bulge. Star formation continues in the bulge region, producing stars younger than 10 Gyr, in particular along the bar, enhancing its metallicity. The disk component appears to build up on longer time-scales.